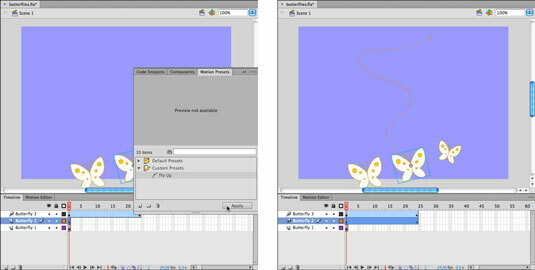 Motion Presets in Adobe Flash CS6 take to a new level the concept of reusing animation behavior, by allowing you to take a “snapshot” of an animation’s behavior and save it as a handy preset that can be applied anywhere and at any time for any project. As with Copy and Paste Motion, Motion Presets store behavior, not specific symbols. Motion Presets are especially useful if you’ve taken the time to design a particularly complex animation sequence, such as a bouncing ball complete with eases and loss of inertia, and want to use it within another project later. You can use the Motion Presets panel to save, manage, and apply Motion Presets. Motion Presets are saved within the application, not the project file, so you can access all your created presets from within any project. Open the Motion Presets panel by choosing Window→Motion Presets. Select on your Timeline the Motion Tween span you want to save as a preset. You can generally select the entire span by clicking it once directly in the Timeline panel. 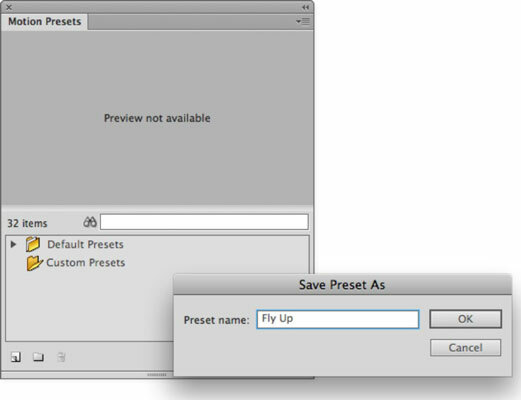 In the lower-left corner of the Motion Presets, click the Save Selection As Preset icon. When the Save Preset As dialog box appears, enter a preset name in the text field and then click OK. The new preset appears in your Motion Presets panel. Click to select on the Timeline a layer containing a symbol instance that you want to apply a motion preset to. For the best result, make sure that the layer has no other animation on it and that it contains a single instance of a symbol. If the Motion Presets panel isn’t already visible in your workspace, open it by choosing Window→Motion Presets. Locate the Motion Preset you want to apply. If you have none of your own presets, you can choose from a number of precreated presets in the Default Presets folder. Click to select the preset you want to apply, and click the Apply button in the lower-right corner of the Motion Presets panel. Your selected layer and symbol now have a new animation applied. Press Enter (Windows) or Return (Mac) to preview the animation on the Timeline. Though you should target an existing symbol instance on the stage with Motion Presets, if you attempt to apply a Motion Preset to nonsymbol graphics, Flash converts the selected graphics to a symbol on the fly.